For Father’s Day we decided to all meet at Mom & Dad’s lake house and bring lunch to them instead of going out to a restaurant. The CompostMaster did a most excellent job of grilling Angoori Shrimp (Glazed Shrimp & Grape Kebobs), Asian-flavored chicken kebabs (declared by Nephew #1 to be “the best chicken I’ve ever tasted”), zucchini and pineapple. In addition, we had a pasta salad, Spinach Salad with Macerated Blueberries and Nectarines (recipe below) and, Dad’s favorite, pineapple upside down cake. I guess we’re a fruity family. This salad travels well. 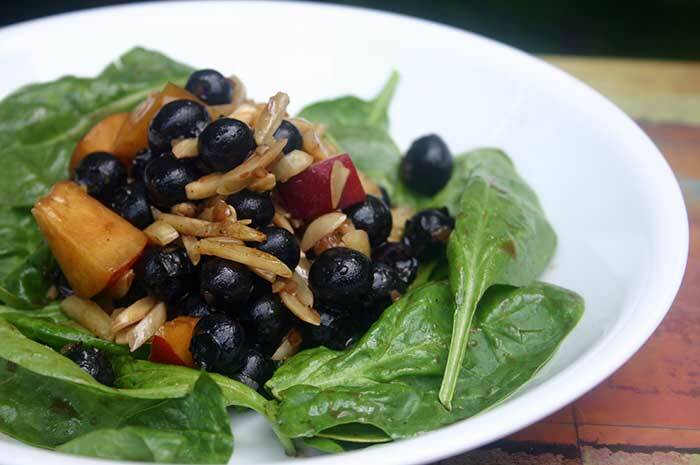 Basically, you can mix up the dressing for the macerated blueberries and nectarines ahead of time. Then, just before you’re ready to eat, add the spinach and nuts. In fact, I often macerate the fruit, store it in the refrigerator and then we have an instant, no-fuss salad quickly ready for lunch or dinner. Mix up the dressing with any type of balsamic or wine-based vinegar you have. This is a great time to experiment with those vinegars you picked up at the specialty shop. Fruity vinegars work very well. Add 1-1/2 pounds of whatever fruit is in season. Blueberries have just arrived at the farmers’ markets here in North Carolina, so I used them (and, boy, were they good). Try apples and pears in the fall or oranges and mangoes in the winter. You can also use frozen fruit in a pinch. Mix in some salad greens. Add your favorite nuts. Walnuts, almonds and pecans all work well. If you come up with a particularly good combination of vinegar, fruit, greens and nuts, I’d love to hear about it. In a large bowl, whisk together vinegar, oil, shallot, salt and pepper. Add blueberries and nectarines plus any juice that accumulated while you were chopping the nectarines. Toss to coat and let sit for at least 10 minutes. Add spinach and almonds and toss until leaves are evenly coated with dressing. Serve immediately. If you want to reduce the amount of Fat in this salad, use fewer almonds. If you want to cut back on the amount of Sodium, use less of the added salt.